If you share a child with your partner, it is very important to establish paternity in Illinois. This applies to men who have a child born out of wedlock. Under Illinois statute, it is presumed that any child born during a marriage is that of the father. However, when a child is born out of wedlock there is no such presumption, and the father must undertake certain actions to establish his parental rights as the father. By establishing paternity, it ensures that your rights as a father of the child, as well as your child’s rights, are protected. Without it, the financial, medical, and inheritance benefits of your child may be at stake, and your privileges as a parent can be compromised. In Illinois, there are two methods used to legally establish paternity; Voluntary Acknowledgement of Paternity (“VAP”) and adjudication of paternity by a family law court. VAP is simple and straightforward. It is a legally binding, mutually signed agreement that is used for establishing paternity. Typically, a VAP is done when a child is born at a hospital. However, it can also be completed and signed at a later date. Both the parents must complete and sign a form known as the Voluntary Acknowledgement Paternity Form. This step is generally required to put the name of the father on the child’s birth certificate at the time of birth. Most hospitals in Illinois now offer the forms to unmarried parents and explain how to complete the forms and the importance thereof. The VAP makes sure that the birth certificate has the correct father’s name and enables the family to have access to essential information. Aside from securing certain benefits for the child, which the child may receive from their father, it also serves as legal proof of a parent-child relationship. This proof comes in handy if the father wants to pursue his parental rights should the couple separate. Maintain a relationship with children: With paternity already established, the father may petition the court to be awarded parenting time. Make collaborative decisions:. This gives the father the right to petition the court to require the mother to make collaborative decisions regarding medical care, education, religion and other important matters with regard to the child. Stop third party adoption: If an unmarried mother is planning to give her child up for adoption, the father with the legal proof of paternity can intercede to bar the adoption and protect his rights as the father. Additionally, the father may also prevent a new spouse of the mother from adopting the child. Stop removal of the child: Probably the most important benefit of having a VAP is the ability to bring an emergency petition to bar the mother from removing the child from the child’s home state or from the country. 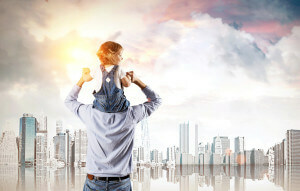 Absent a VAP or adjudication of paternity, a father has no legal standing to bar the mother from removing the child from its home state or the country. If you are seeking the legal services of an experienced family law attorney to fight for your father’s rights and protect your interests, we can help you. Contact Keller Legal Services today at 630-868-3093 for a free initial consultation. Our experienced father’s rights attorneys have more than 25 years of experience in helping fathers with their family law issues. We represent clients in Kane County, Will County, and DuPage County, as well as other areas in Illinois.